The main problem with the continental scheme of world division is its mixture of physical geographical criteria (continents are defined as landmasses more or less separated from each other by waterways) with human geographical criteria (Europe is separated from Asia not by the physical landscape but by historical and cultural features). Intellectual coherence calls for one basis of division or the other. When human features are favored, the continental architecture vanishes altogether as North Africa joins the quasi-continent of the “Middle East,” while Latin America links southern North America with South America. Continents are thus essentially regions of physical geography, and should be defined accordingly. But the standard physical definition of continents remains problematic, as the “more or less” formulation allows conceptual slippage. In much of the world, North and South America are viewed as a single continent, since they are clearly connected by the Panamanian isthmus. 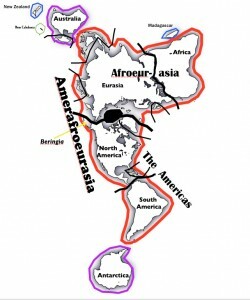 But by the same criterion, Eurasia and Africa would also have to be regarded as a single continent, Afroeurasia. And if one takes a long historical perspective, the Americas and Afroeurasia together form a single super-landmass. They are not separated by deep water, and they have been periodically joined together over the past few hundred thousand years; when the world goes into a glacial period, sea levels drop and the vast plains of Beringia emerge to link the two lands. When Beringia appears, temperate and arctic animals migrate between the continents. As a result, the fauna of temperate North America and Eurasia are remarkably similar. Even during non-glacial periods the circum-polar region forms a zone of inter-continental linkage, as is clearly visible on the Dymaxion projection map above. A strict physical definition would thus hold continents to be landmasses enduringly separated from other landmasses by relatively deep waterways. If one employs this scheme of division, a very different map of the world emerges, one dominated by a mega-continent that we might call Amerafroeurasia, or simply “The World Continent.” This landmass is divided into the macro-continents of the Americas and Afroeurasia, which in turn are split into the “continentoids” of North America, South America, Eurasia, and Africa (the term “continentoid” indicates that these lands are not actually separated by water). A third order division of the world continent separates associated large islands and island groups, most of which are joined with the landmass during glacial periods. 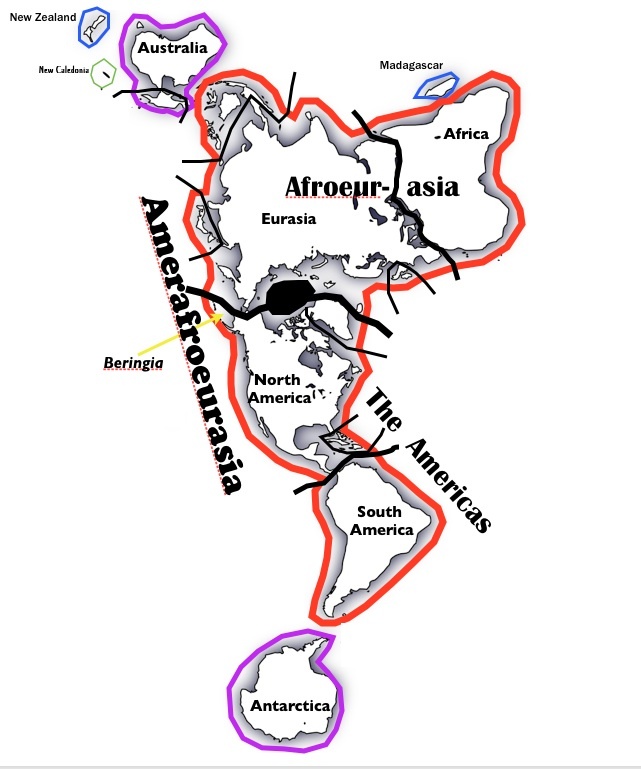 Clearly separated from Amerafroeurasia are the meso-continents of Australia (including New Guinea) and Antarctica, which have not been connected to other lands for millions of years. As a result of such separation, Australia has a highly distinctive fauna. By the same token, Madagascar and New Zealand may be considered micro-continents. Focusing in still more closely, one may even distinguish nano-continents, such as New Caledonia. A nano-continent is distinguished from a mere oceanic island (such as Hawaii) by the fact that it is composed of continental crust that long ago hived off from a larger landmass. 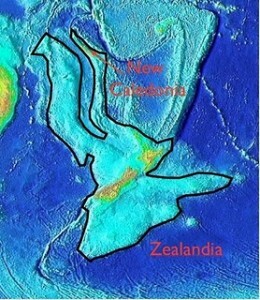 Alternatively, both New Caledonia and New Zealand can be regarded as fragments of the largely submerged meso-continent of Zealandia (see map above).